I have these moments a couple of times a week where I need folk music. An internal trigger kicks in and demands its presence. Folk is a funny type of music for me. I have always enjoyed the influence it plays in music rather than the genre as a whole. This is quickly changing. Fleet Foxes created the shift. Then bands like Typhoon and Stornoway helped to expedite my change in thought. Folk is not extravagant. It is gentle and stripped to the necessities. The honestly that this music brings is what tends to draw me in. Authentic, relatable stories where lyrics lead the listeners closer to the music is the center of folk music to me. Folk music is much like a good friend. It serves as a simple reminder to take a step back, slow down and enjoy life. My weekly folk triggers bring a certain sincerity to my overall listening experience, and this is causes me to grow closer to the genre as a whole. My latest reaction to the music from the roots has come from Colorado-based band, The Lumineers. 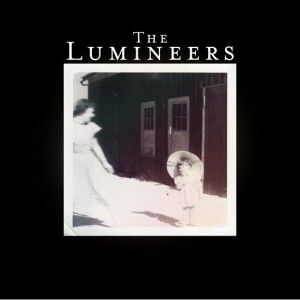 The Lumineers released their self-titled debut last week and I have been unable to stop listening to it. After I stumbled upon their Daytrotter session, I knew that this was a band that I needed to follow. After little more than a month of anticipation, The Lumineers have delivered. As I lie in bed, I realize that I am listening to this record for the fourth time in a row. I have no idea what happened to the time, but these songs have not only won me over, but brought me closer to folk music. Front man, Wesley Schultz is believable with his lyrics and his stories are relatable. I am captivated by the simplicity and proudly overwhelmed by the sensibility that the Lumineers offer. The album kicks off with sweet guitar picking and introduction to the rasp of Schultz’s voice. Track, “Flowers in Your Hair” does an unbelievable job of setting the stage for the rest of this album. Neyla Pekarek (piano, cello) supports the chorus and causes listeners to be taken on a ride. Sitting just under 2 minutes, this song is the ideal pitch at the front of a record to catch listener’s attention. This is a fantastic tactic for grabbing as many early adapters as possible. Song, “Slow It Down” is probably the simplest song on the record, but easily my favorite. The track showcases of Schultz’s honesty as a writer and it helps to create a genuine affection for me. A tale of failed love pieced together through rich imagery. Opening line, “I feel a filth in my bones, wash off my hands ‘til it is gone” provides an ugly, but honest context surrounding a lingering break. Curtains, car windows, beds and many other objects are leaned on throughout this song to paint a picture for listeners. The more I listen to this song and the others, the more I appreciate the value that The Lumineers place on imagery. The last track on the record is “Morning Song” and I notice an interesting twist in their style with this one. This track adopts a Celtic-like vibe with the guitar riffs between Schultz’s vocal exchanges. It sounds like bagpipes could be brought in for support. I find this twist interesting, but engaging. The unexpected turn still captivates me with each play. The Lumineers are a band that is going to continue to gain more importance for me as 2012 progresses. They are the glue that is going to keep me connected to my folk roots. This release is a must-listen for those that need a simple dose of roots music to pass through the week. While folk will never be my favorite style, I know it will always grab my interest as long as there are at least one band like The Lumineers to introduce themselves to me every year. The Lumineers will perform at Radio Radio in Indianapolis on May 25. Tickets are available for $10 via MOKB Presents.